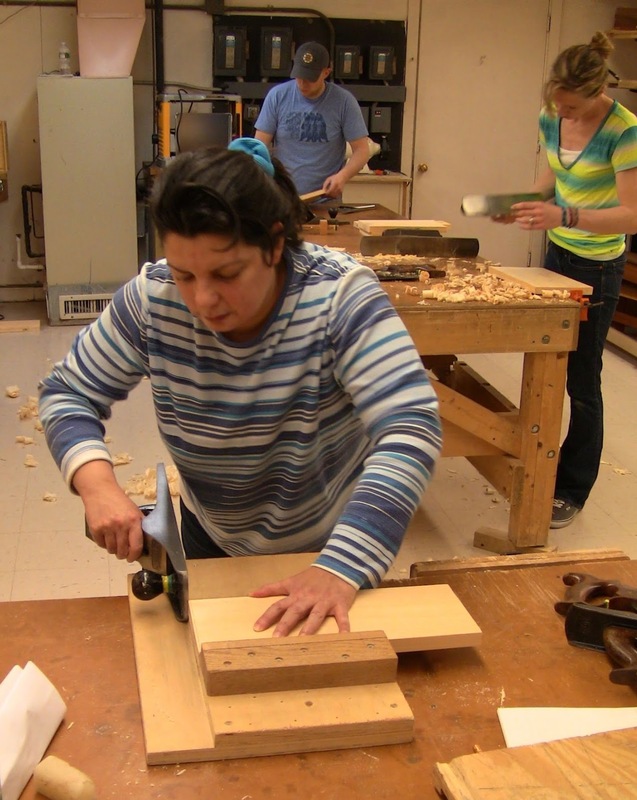 Anita jointing an edge with a #6. Note the satisfying pile of shavings covering her workbench! The class has been going well. Everybody's been making great progress. Yesterday was the 5th session, where several students completed their first assembly steps, the edge-glued joints for the sides. The remaining students are close behind. This joint of course requires carefully planed edges, so the weeks following the first class have included how to handle planes in their different functions of roughing, flattening, and smoothing, the FEWTEL sequence for dimensioning parts (Face, Edge, Width, Thickness, End, Length), and practice on sacrificial stock. 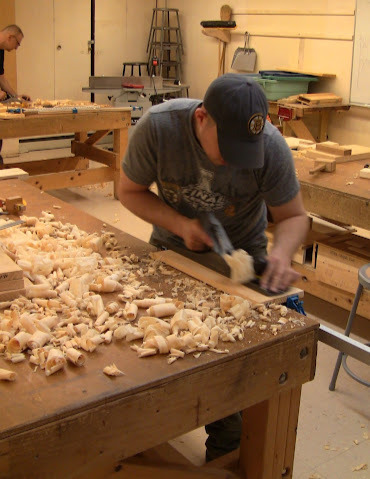 I also covered sharpening of chisels, plane irons, and handsaws. Becky had brought in her father's old Handyman jack plane, so I showed them how to camber the iron on the shop's power grinder, then hone the curved edge by hand. Becky roughing a face with a #5. More shavings! Matt flattening a face with a #6. Paul roughing a face with a #5. 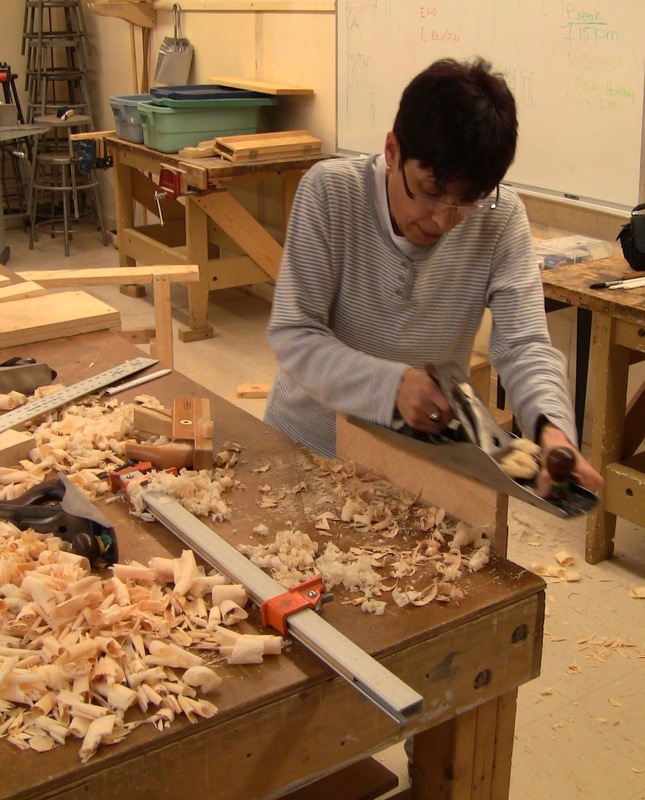 Cheryl taking down a freshly ripped edge with a wooden scrub plane. These last two weeks have been focused on the project, producing the dimensioned parts. With the stepped sides glued up to width, next we'll start on the joinery. The step is dovetailed to the sides, while the top is attached with mortise and tenon. As before, we'll do some practice on sacrificial pieces before committing to the project parts. ...then shooting the end square and precise with a #6 on the shooting board. 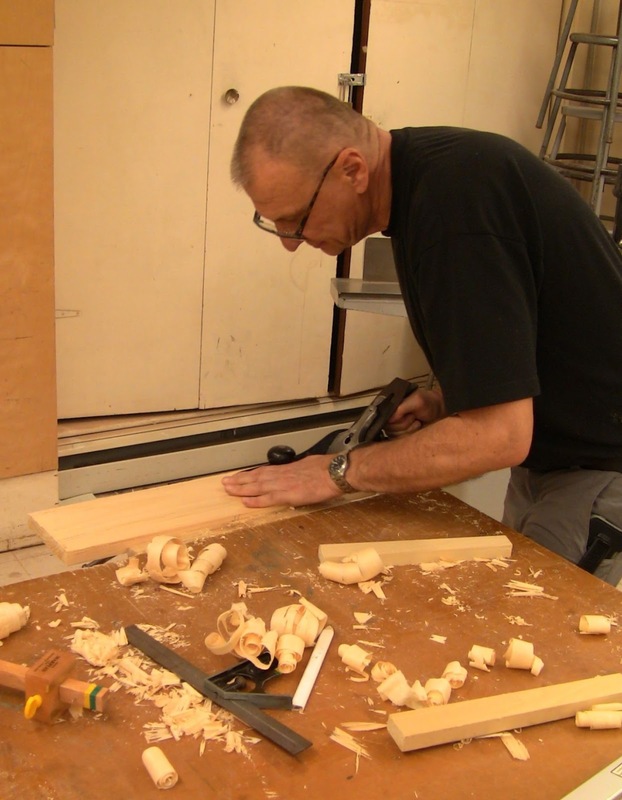 Paul flattening one of his short side pieces. Becky ripping a long side piece to rough width. 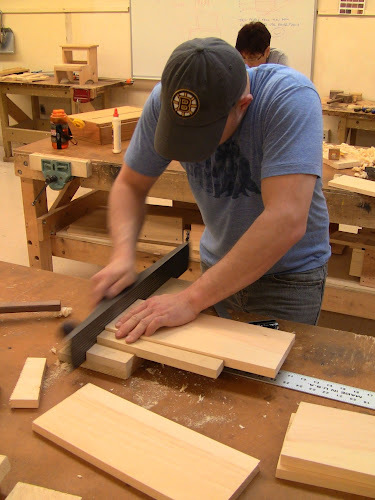 The benches in the shop are really setup for power tools, not hand tools, so other than a front vise they don't offer many work-holding options, no dog holes or planing stops. 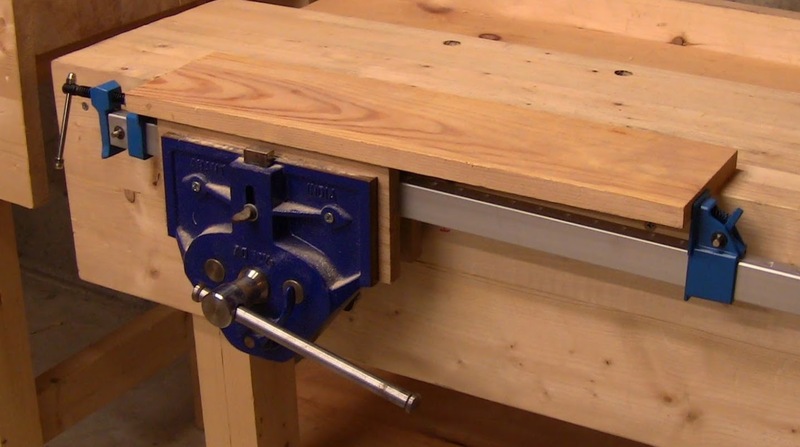 A very effective method Paul Sellers had shown me is to hold an aluminum bar clamp stuffed with wood in the face vise, and clamp the workpiece in that lengthwise, another form of poor-man's tail vise. The students did most of their planing this way. The bar clamp is stuffed with wood so it doesn't get crushed in the vise. This holds effectively for rough planing across the grain or finer planing with the grain; most of the workpiece is supported by the workbench. However, because the wooden jaw liners in their vises are a foot long, this method doesn't work for shorter pieces. So I made a simple planing board, basically a large bench hook (18"x18") with a 3/8" thick stop strip on the left edge in addition to the one on the back edge. 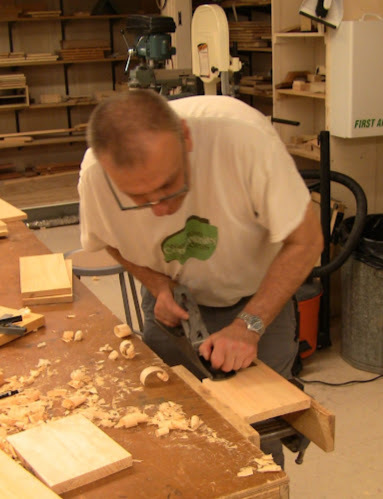 That allows planing small parts in either orientation, to the back or to the side stop. The front edge hook is glued and screwed from the bottom. 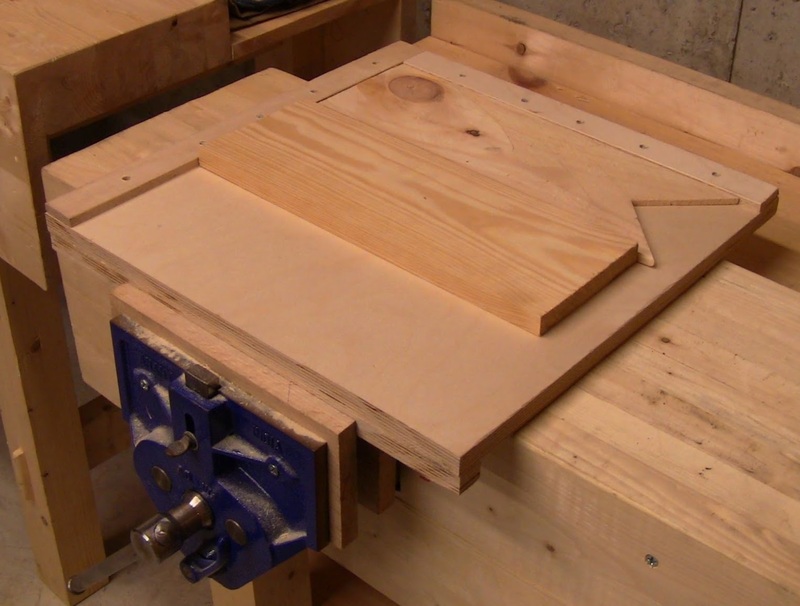 With the front hook clamped in the vise, a piece in the planing board. The spacer between the workpiece and the rear stop moves the work up closer to the front. 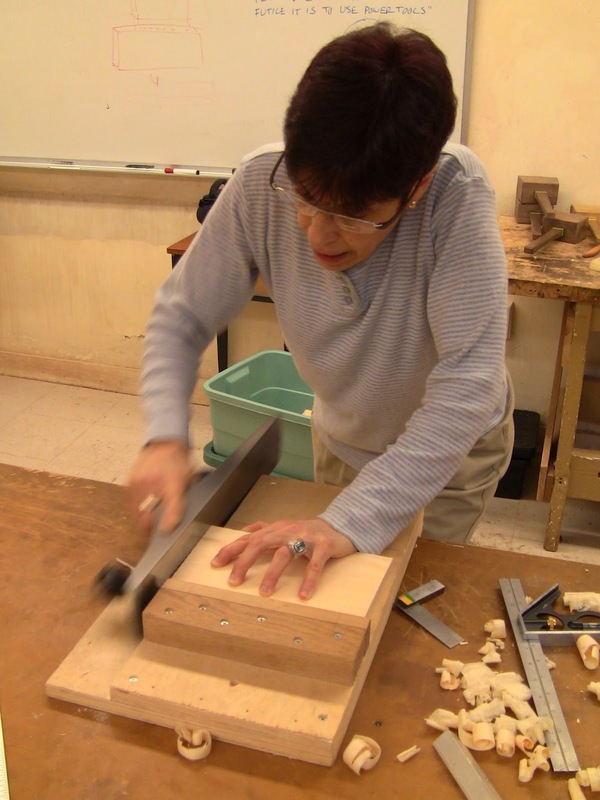 Or you could just make a shallower planing board. The piece oriented for planing front to back. Or sideways across the grain. Or diagonally into the corner. 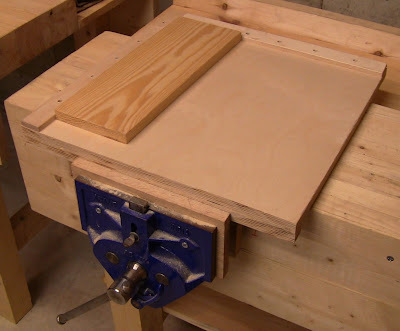 This can also be used on a normal table top without a vise, so can turn any surface into an improvised workbench, clamped down at the rear right corner to keep it in place. The classes are looking good Steve! Great update. Thanks!